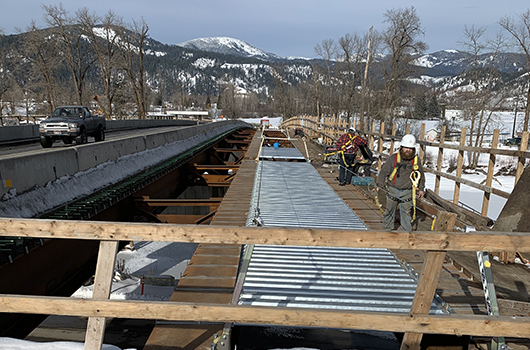 In early April, crews will start work on the driving surface of the bridge over the St. Joe River on Idaho Highway 3 in St. Maries. Two lanes of traffic will run on the newest portion of the bridge, with this and other weather-dependent work, such as the placing of more sidewalks and the paving of Meadowhurst Drive, scheduled for completion this summer. Other remaining work includes placing an overlay and installing fencing on the railroad bridge, which opened to traffic in January 2019. In the meantime, a small crew is still on the construction site performing work that is not weather-dependent. Upon completion, both bridges will include one lane in each direction with a shoulder and sidewalk on each side. Work also includes reconstructing the highway to match the upgraded bridges, replacing guardrail and signs in several locations and improving the adjoining intersections.